Liana: "Rob entranced the entire audience- both children and adults, with his skill, humor and of course, his MAGIC!" 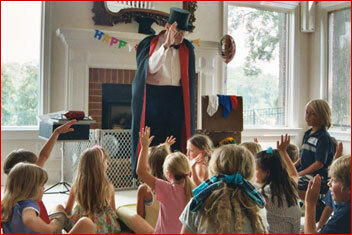 Experience live theater in your home with your child as the star of the show! Rob customizes the show for the age range of the children. For the younger children, everything is magical; the emphasis is on silliness and stories. Puppetry is a favorite feature. Children a little older especially enjoy the empowerment and humor that comes from being one step ahead of the magician and making the magic happen. Children 5 � 8 find magic is fun and amazing. 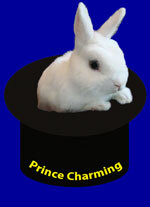 The older children enjoy the challenge of being fooled, and especially enjoy learning magic they can do themselves. All children are treated with respect. Frequently it is the magician who is �in trouble� or cannot see what the children do, or who needs the help of the children to make the magic work. 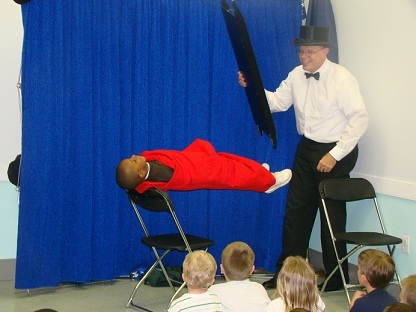 Your child starring in the magic show! 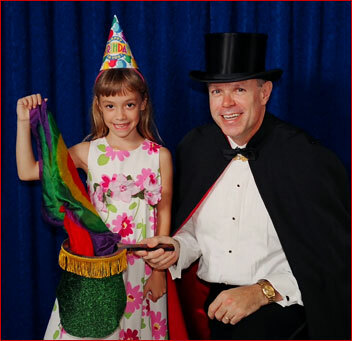 Rob the Magician appearing in full costume with collapsible top hat and red satin-lined cape and magic wands for every occasion. A home theater experience including a PA system, music, and a theatrical backdrop. Fun fast-paced magic that involves every member of the audience. The birthday guests each receive a magic wand and other magic goodies. The guest of honor receives a magic kit that might just launch a career in show business.